To take a quiet moment away from the bustle of Christmas Day I usually go out and have a look around the garden to see which plucky plants are in flower. It always takes me by surprise to see how many flowers there are: occasionally a wayward rose, often a hellebore and usually one of the scented Viburnums. There are never masses of flowers but at this time of year each one is worth more than a whole border in midsummer. The plant that is always flowering, sometimes peeking through a layer of snow, is a hardy cyclamen, Cyclamen coum. In the shade of a walnut tree, a few plants, that I bought ten years ago, have spread into a carpet of pink and white flowers that will continue through to March. Although individual flowers are just a few inches tall each plant produces dozens of flowers. Cyclamen coum are tough plants that don’t need mollycoddling in order to produce masses of beautiful flowers. The garden writer EA Bowles wrote that they ‘pay good rent’ because as well as their dainty flowers they often have attractively-marked leaves. A relative of the primrose, Cyclamen coum grow in woodlands and shady rocky places from Bulgaria to Turkey and around the eastern Mediterannean, particularly in Lebanon and Israel. They are dormant during the summer, starting into growth during the autumn when the weather cools and the rain starts. The foliage dies back in April or May. The colour of the flowers in the wild varies through several tones of pale pink, with an occasional magenta or white flower. The round, leathery leaves are dark green and from time to time they have a grey speckle or a grey band around their edge. These are the ones that breeders have used in order to produce plants with silvered or marbled leaves. If you want to create a mass of flowers to be looked at from a distance, then plant straightforward C. coum; you will probably have an interesting range of pink and magenta flowers and may get some unusual seedlings. If, however, you want plants that are a bit more special and that repay close examination, then you should plant some of the named varieties. C. coum ‘George Bisson’ has white flowers with a light grey marbling on the leaves. C. coum ‘Maurice Dryden’ also has white flowers but the leaves are a shiny pewter colour with a dark green edge. The most sparkling of the white-flowered forms is C. coum ‘Golan Heights’, which was originally found by a Cyclamen Society expedition to the Midddle East in 1990. C coum ‘Nymans’ has a startling combination of dark magenta flowers and silvered leaves. Similar foliage is found on C. coum Pewter Group but the flowers are a much more restful pale pink. One of the most unusual varieties is C. coum ‘Tilebarn Elizabeth’, whose flowers are white with a deep pink edge. No matter which form of Cyclamen coum you decide to plant, you are guaranteed a reminder that, bleak though the winter weather might be right now, warm Spring days and colourful gardens are just around the corner. 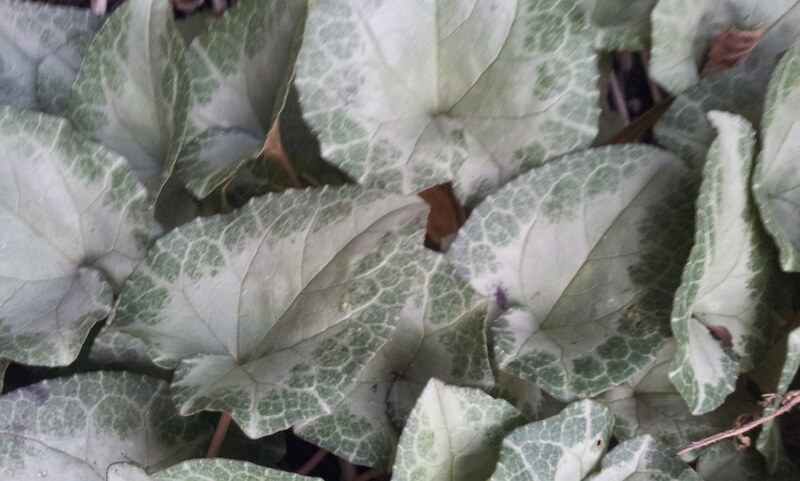 The foliage of a white-flowered Cyclamen coum that appeared as a seedling under a Daphne in my garden. In the wild, Cyclamen coum grow in places where there is dappled shade in the summer and where the soil is moist during autumn and through to spring. These are conditions that are easy to mimic in Britain. The ideal place is underneath the canopy of deciduous trees and shrubs or in the shade of a garden wall or fence. In cold wet soil the tubers will rot, so good drainage is essential. If you have heavy clay soil dig some leaf mould or grit into the area before planting. Cyclamen coum flower best in poor soils, so don’t be tempted to dig in compost or to add fertiliser as this will give you a wonderful crop of leaves but few flowers. Don’t be disappointed if you only have a few flowers in the first season, as Cyclamen coum need time to settle in, and the number of flowers will increase with each year. Left undisturbed they will soon make lake colonies. They are prolific self-seeders: leave the young seedlings where they are in the ground until they form a small tuber and then dig them up to transplant them elsewhere. It is better to start off with plants in pots that are already growing than with dry tubers. The tubers that you can buy in supermarkets and garden centres have been dry for a long time and usually take a year before they begin to flower in the garden. If you can only find dry tubers, plant them about 1cm (half an inch) below the soil and give them a thorough watering. Make sure that you plant them the correct way up: the bottom of the tuber is rounded and the top has a slight indentation from where the flower stems will appear. Cyclamen coum can be planted in short grass and allowed to naturalise but you won’t be able to mow the grass until the leaves have died down in early June, as is the case if you were growing daffodils in grass. 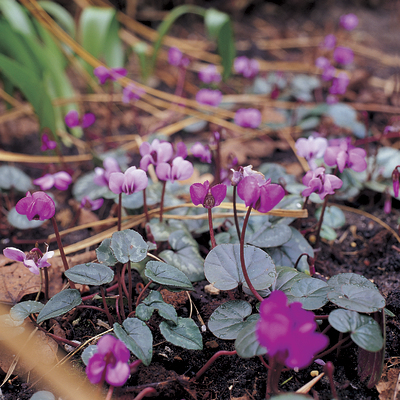 Cyclamen look best grown by themselves but you can plant small bulbs such as crocus and snowdrops amongst them. Avoid vigorous bulbs, such as muscari or the winter aconite, Eranthis hyemalis, as they will eventually smother the cyclamen. It is not advisable to plant Cyclamen coum with other types of cyclamen. The earlier-flowering Cyclamen hederifolium is also hardy and needs the same growing conditions as C. coum but is much more vigorous and will eventually swamp the later-flowering species. Florists and supermarkets are full of cyclamen house plants at Christmas. Don’t confuse them with hardy cyclamen. Florists’ cyclamen are descended from a species, Cyclamen persicum, which is not hardy in Britain, so they wont survive if you plant them out in the garden.